Advancements in medical science have led manufacturers to develop various devices and medical equipment, human life betterment being the sole purpose. Such is the case with blood transfusion, where manufacturers have come up with devices that allow efficient and infection free transfusion. Autotransfusion devices are gaining high acceptance owing to benefits such as infection transmission, better transfer of oxygen and absence of isosensitization. With increasing occurrence of cardiac diseases across the globe, the need for autotransfusion has risen, thus pushing the demand for autotransfusion devices. As per American Heart Association, more than 80 million people across the globe are victims of heart problems, which is result of unbalanced diet, increasing stress and change in lifestyle, which results in hemorrhage. Moreover, allogenic blood transfusion used in cardiac surgery results in higher blood loss. This aspect coupled with growing incidences of heart problems and cardiac surgeries has resulted in adoption of advanced transfusion systems, thus propelling the growth in use of autotransfusion devices among several end users such as hospitals and ambulatory surgical centers. According to the analytical research done by Transparency Market Research, the global market for autotransfusion devices is projected to expand at a stellar pace in the years to follow. This market growth is triggered by increasing use of autotransfusion devices in hospitals and cardiac research centers. The global market for autotransfusion devices is expected to rise at a CAGR of 6.9% during the period of forecast, 2017-2026. Medical device manufactures all over the world are continually striving to invent and introduce additional features in their products. For example, Fresenius Kabi has come up with a continuous autotransfusion method that permits continuous flow of blood eliminating fat content from blood. Players involved in developing autotransfusion devices include Fresenius Kabi, Haemonetics, LivaNova, Medtronic, Terumo Corporation, Stryker, Atrium Medical and Advancis Surgical. North America has been the main pivot driving the use of several medical devices and equipment. The region, especially United States, is marked with increasing number of cardiac problems. Population in the region have a fast yet stressful lifestyle, which is the main cause of heart diseases in the region. Moreover, incidence of cardiac surgeries in United States and Canada has risen which has prompted healthcare facilities to adopt advanced medical equipment to carry out efficient operations. This has resulted in growing adoption of autotransfusion devices in North America. According to World Health Organization, the number of deaths in United States due to cardiac disorders crossed 45,000 in 2015. As per American Heart Association analysis, around 2,200 people in United States die each day owing to cardiac disorders. This has fuelled the need of initiating advanced medications in the country with higher precision in treatment and operations. According to research, the sale of autotransfusion devices in North America is expected to reach US$ 890 Mn by end of the year of assessment. Autotransfusion devices are used in different healthcare faculties such as hospitals and ambulatory surgical centers. Transparency Market Research observes that adoption of these devices in ASCs (Ambulatory Surgical Centers) has risen since past years. ASCs have specialist surgeons, advanced medical equipment for operations, and enhanced operating rooms. Moreover, they have reduced risks of infections as compared to hospitals. These aspects have resulted in increasing surgical procedures in ASCs that directly have influenced the adoption of autotransfusion systems in these facilities. Analytical research report on global autotransfusion devices market offers valuable market intelligence providing detailed forecast analysis that depicts the growth of the global market. The forecast analysis is carried out for a period of nine years, starting from 2017 till 2026. This can support the reader in gaining qualitative and quantitative insights on the future market trends basis which future moves can be planned and actioned accordingly. The research study includes in depth analysis on various regions in the globe. Scenario of each segment and sub segment of the market across key regions is covered. The research report on global market for autotransfusion devices, thus can address key concerns of manufacturers of these devices by enabling them to gauge the growth potential of various regions for business expansion. 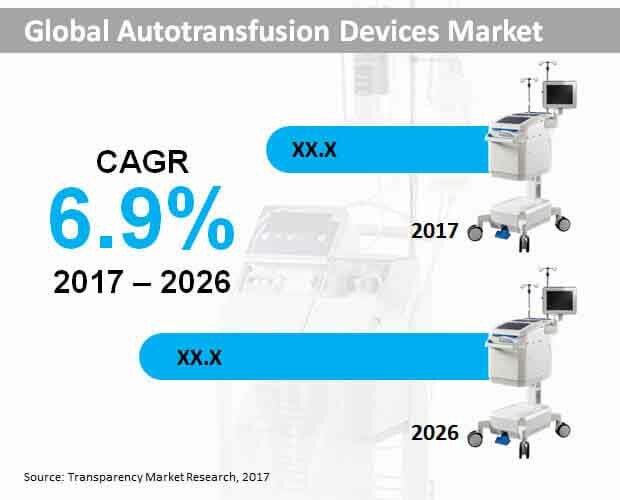 Growth of the global autotransfusion devices market is influenced by various factors such as key trends, opportunities, drivers and challenges. Their scenario across important regions is assessed which portrays the impact of a particular region in the overall market’s growth. The research thus reflects a holistic approach in this study. Key revenue pockets can be identified with this extensive research to carry out potential business expansion plans. Considering the attractiveness of the global autotransfusion devices market, data points based on fluctuating cost structure and pricing has been covered. This analysis has been carried out with the help of a robust research methodology that harnesses baseline information to forecast the market size. Secondary and a simultaneous primary research has been carried out to gain high level accurate insights on the global market. Moreover, this high accuracy is obtained owing to several re-evaluations and validations of the data so collected. Market information from observes, influencers, key players and subject matter experts is also collated and with the assistance of advanced research tools and triangulation method, single data point pertaining to each and every segment at a global as well as regional level is obtained. Based on past market scenario, current market position, future market insights have been drawn with the support of this exclusive research methodology. Leading companies involved in the manufacturing of autotransfusion devices have been analyzed and profiled in this research report. Companies can avail this report for assessing their current market standing, and understanding opportunities for enhancing their position. Competitive dashboard section in this research study talks about key financials, product developments, product portfolios, innovations, key strategies, key personnel and expansion plans of major players in the autotransfusion devices market. This concluding chapter of the report assists the reader in achieving competitive advantage in the coming years. To sum up, the research report on global market for autotransfusion devices portrays a 360 degree analysis on key market segments across important regions in the globe. The detailed market segmentation covered in this research report covers all angles of the market thus depicting a complete analysis scenario of the market nine years down the line. Moreover, Transparency Market Research offers a 24x7 analyst support its clients in case of any queries. The research report entails a systematic research structure based on a systematic research approach with the help of a robust research process that increases the credibility of the research carried out. Incisive, highly accurate insights and recommendations with actionable intelligence can be obtained from this research study.